After a strong opening issue, Ultimate Comics Wolverine has a lot to live up to. 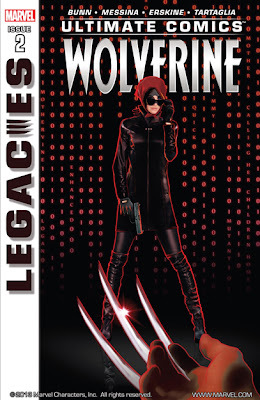 With the promise of both development in Wolverine's and his son Jimmy's characters, writer Cullen Bunn faces the challenge of trying to balance two separate but connected timelines at the same time without overwhelming the readers with constant flashbacks and flash-forwards. For the most part, this is achieved quite well, as the out of time portions of the book are clearly defined. It's nice that the locations of both timelines are aligned, orienting readers to time gone by and relative age. The plot moves at nice pace in this book, even stopping for a small detour so that Jimmy is able to spy on his now childless foster parents. Black Box, who has been previously underdeveloped, gets some dimension to his character, as well. In the typical fashion of the Ultimate Marvel universe, there's a shock factor that goes into it all which is glaringly apparent in this book. From the "skinning" of some bad guys to a very, very continuity-impacting claim, the book is in no way short on action and drama. While not as strong as the opening issue of the series, Ultimate Comics Wolverine #2 provides for a nice segue into what is inevitably going to be a lot of explaining that has to be done.